Q1: Please could you describe your experience visiting our store? I visited the Liverpool store twice before I ordered my dress, and was met by Lucy on both occasions. It was the first place I visited, and I can honestly say I felt so comfortable and not under pressure. I had a pretty clear vision of what I wanted, and Lucy just got it immediately. It was super relaxed, and just like having a chat with a friend. I went for Jesus Peiro, a designer that funnily enough I saw for the first time at a White Closet night time event at the Rose Garden in Didsbury, months before I actually started looking for my dress properly. I wanted a super dramatic silhouette, that was unfussy with really clean lines, and this designer seemed to meet every one of my requirements. Q3: Did you have any accessories from us and how did you feel in your dress on your big day? No accessories, but I felt incredible - so comfortable, and so stylish. I didn’t want to take it off! I had three bridesmaids, and they all wore cream jumpsuits from Lavish Alice. The jumpsuits were all slightly different designs and I have to give all the credit to one of my bridesmaids for finding all the outfits in a sample sale! They looked incredible though, on trend but really classic at the same time. I didn’t really have any colour in the wedding because I wanted an almost monochrome look for the bridal party and groomsmen, and they all looked unbelievable. One of my bridesmaids came with me when I collected my dress, and Eve at White Closet Studios was happy to let her try all the jumpsuits on next to me in my dress so we could see how they looked, it was such a nice moment. No - this was my first! I went to one other afterwards, but my heart wasn’t in it because I’d already found my dress at White Closet Studios (and nothing compared to Jesus Peiro). The best bit of advice I would give was from my wedding planner on the morning of my wedding (shout out to Chiara at Avenue Cipresso) which was that it’s normal to be stressed or nervous, it’s ok, and not to fight it because you’ll make yourself feel worse when you can’t! Secondly make sure you spend a good half an hour or so with your husband on the day, away from all your guests, it’s really important to let it all sink in together and I think it was the best bit of my day. Finally - just make sure when you’re trying it on that your dress is comfortable! Mine was so comfy I was fine all day, sitting or standing, but I’ve heard horror stories about people wanting to take them off after a few hours of sitting down for the meal. It did and it didn’t - the biggest upset was that we were supposed to have the meal outside, but (uncharacteristically for Italy) it rained, so everything moved inside. Thankfully we had an exceptional planner who coordinated everything beautifully, so we really had no stress at all on the day, and if anything the move made for a better atmosphere and much better pictures! 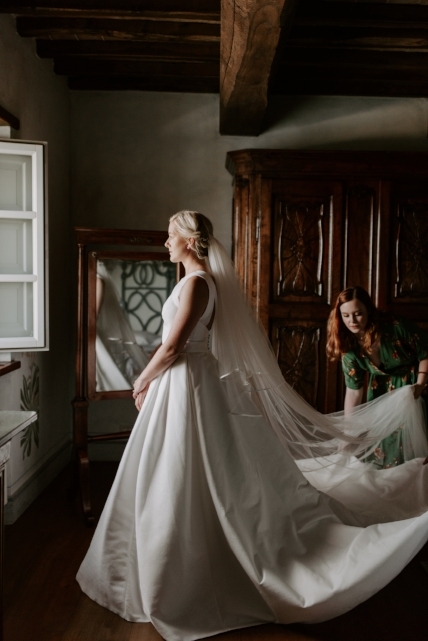 I’d love to credit our planner - Chiara at Avenue Cipresso and our photographers - Grace Elizabeth Photo and Film, they were both incredibly professional and understood the exact look we wanted. Also I went to Tusneem at Boutique Alterations and she was so kind and just amazing at her job! 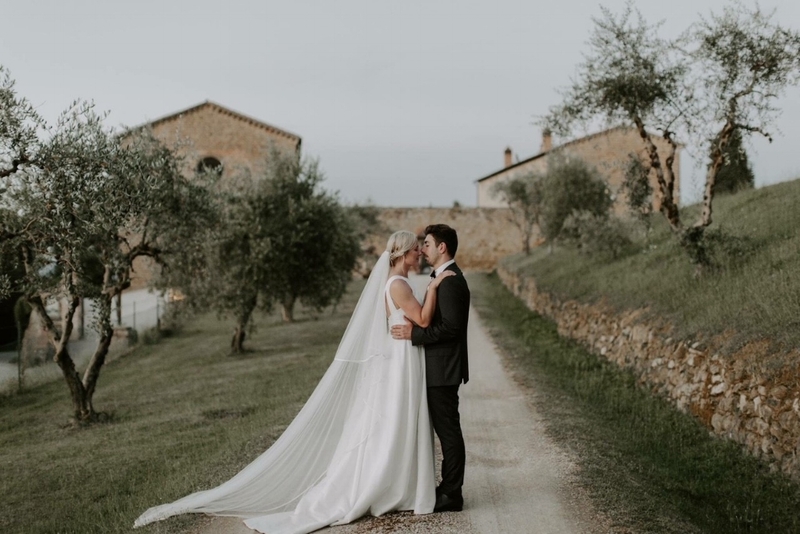 Others I would recommend to those getting married in Italy are our incredible caterers, Apollinare Catering as well as our florist Roberto Fiori, and the amazing bands, The Wedders and Blue Moon Jazz Trio. They were all super professional and made the day so perfect.